Run through the bloodrain on the streets. Run fast before the police arrive. on the wide plains, it’s perpetually overcast. and what have I done? He would live right. why do you crowd in on me tonight? 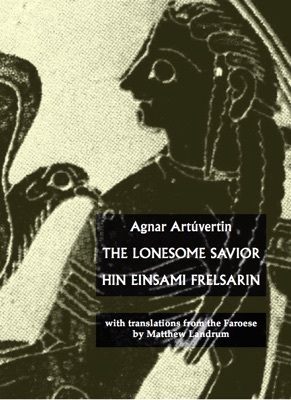 A selection of poems by Agnar Artúvertin, the first in English translation. A Faroese poet and translator with 28 books to his name, Artúvertin lives in Tórshavn in the Faroe Islands. A collection of his poems, entitled Ifreann, was published by Coiscéim, Dublin, in 2012. Translator Matthew Landrum was a 2012 summer program fellow at Fróðskaparsetur Føroya [the University of the Faroe Islands]. His translations have appeared in numerous journals including Modern Poetry in Translation, Asymptote, and Rhino Poetry. He lives in Detroit. He writes: "I first met Agnar Artúvertin at Hvonn Brasserie in 2011, two years after his collection of poetry Jahve Kemur Aftur (The Return of Jehovah) made its debut. We drank wine and talked about his book and the controversy surrounding its release. Satirizing politics – it’s dedicated to the prime minister of the Faroes – the book covers a range of controversial topics including gender, sexuality, and prostitution. When I asked him about the title, he explained that it reflected his views that the poet should sit in judgement over society like an avenging Old Testament God. As time has passed the tone and tenor of his verse have changed. Gone are the self-assured judgements and scathing critiques. The vision of the God of wrath has been replaced by Prometheus, the lonesome savior, solitary and misunderstood, offering his body and soul to torment to bring light to society."